Man, I knew that sense of mitosis so well playing all the solo versions of baseball I played as a kid, whether throwing the ball at a wall or a stoop. 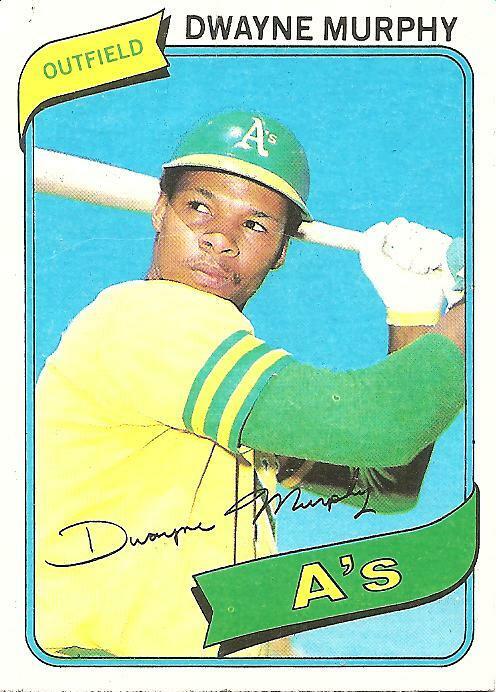 My version of your A’s outfield, a couple years earlier, was the Andre Dawson-Warren Cromartie-Ellis Valentine trio the Expos brought up in the mid-to-late-’70s. How I loved to come up firing like Valentine would on a flare to right with a runner at second! I preferred the Mets outfield of Steve Henderson, Lee Mazzilli, and Joel Youngblood. I was a big Steve Henderson fan. I, too, used to toss a tennis ball at the roof and try to make rangy plays. It was a pretty standard roof, though, so no crazy hops. To spice it up I would use apples from the apple tree. Sometimes I’d toss those onto the roof, wait for them to roll down, then swing at them with a Wiffle bat, splattering them all over the lawn. My mom was never too crazy about that for some reason. This reminded me of something I used to do by myself. I hadn’t thought about this for years and years! I’d be in the backyard, and I’d hold my Alex Johnson signature baseball bat (that I got at a Yankee game played at Shea Stadium on Bat Day in 1975) with my left hand, and throw a tennis ball as fast as I could at the back wall of our house (made of brick). I’d stand really close to the wall. The harder I threw it at the wall, the harder it would come back. (Anyone who took Physics would know this is a no-brainer, but I never took Physics). When the ball came back, I would swing at it. Many times it would be a line-drive, going right back at the wall (and bouncing off again, of course). Other times, it would go over my house and went into the street; it was a home run. I did this a lot. I wonder how many cars I almost hit, or how many people I scared the bejeekers out of from seeing a flying tennis ball coming out of nowhere.) In my mind, I was always Dave Kingman when I did this, of course. Then I’d run past the side of the house and into the street and get the ball. The neighbors must have thought I was out of my mind. They gave quality bats at Yankee Bat Day. That Bat Day at Shea Stadium was the only one I ever went to, but it lasted for years, and it was often used in baseball games using a hardball. I think they were Louisville Sluggers. I remember that during one of the half-innings, Bob Sheppard would implore the crowd to “Please hold up your bats), and everyone did. I was thinking that it was really corny, even as a fourteen year old. As every kid held up his bat, I was thinking that Shea Stadium had turned into a bowl of french fries. That’s awesome. I am very glad to know that a study was done on the impact of real-size bat day on blunt trauma.